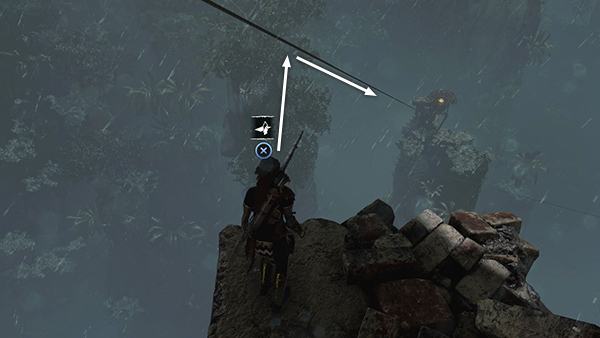 ...and slide down the zip line. 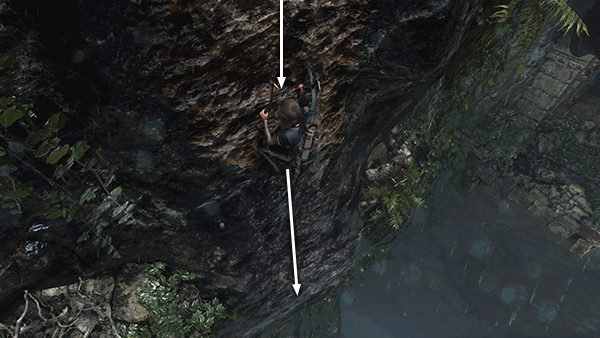 ...and jump across the gap to the next section of climbable rock. 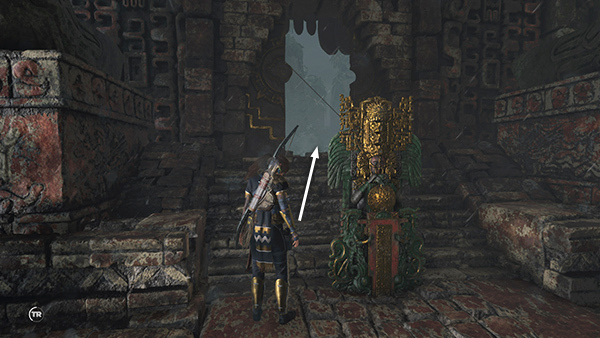 Run back and forth to build momentum, then jump to grab the edge of the huge doorway on the right. 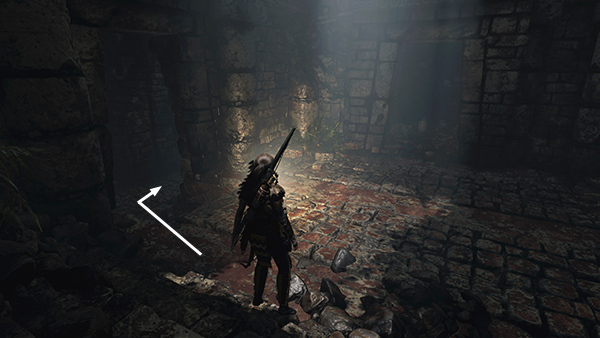 Enter the ruins and pick up some supplies in the alcove ahead, then enter the hallway on the left and advance carefully. 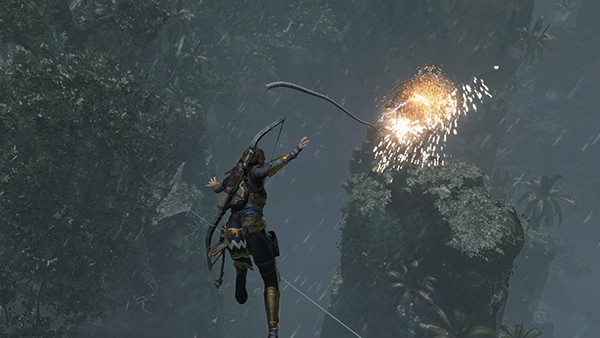 Disarm a spear trap by cutting its tripwire. 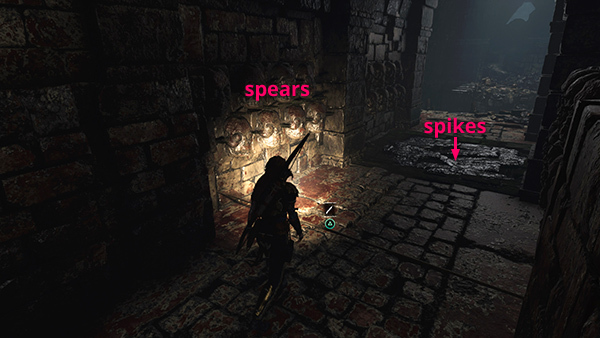 Scramble carefully under the spears, then immediately jump forward to clear the concealed spike pit beyond it. 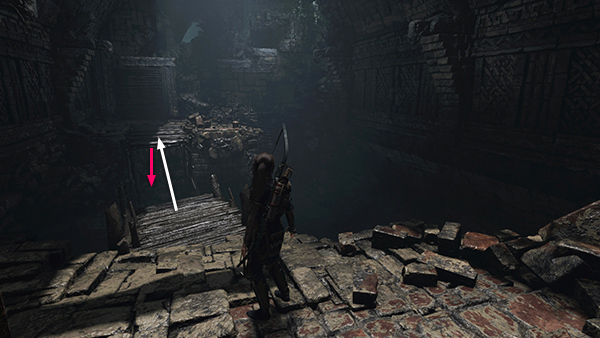 In the next room, as you jump from one side of the broken walkway to the other, the end Lara grabs collapses. 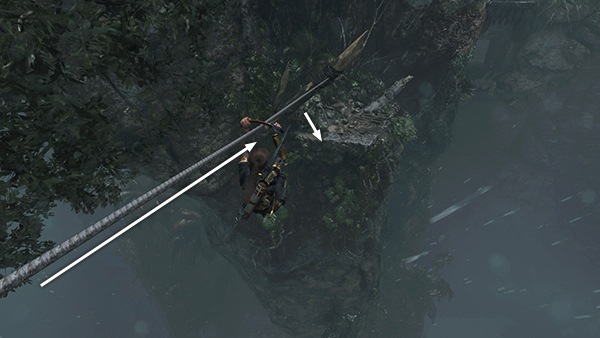 As long as you don't deliberately drop, you'll be fine. Just climb up the wooden slats onto the ledge. Loot another resource container. 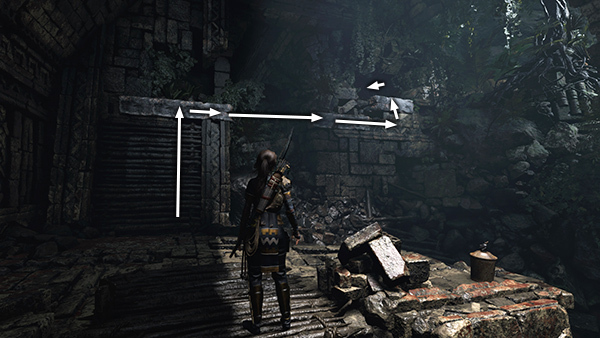 Then scramble up the closed door to grab the lintel, climb/jump all the way across to the right until you can pull up into a low, earthen tunnel. Follow it to the end, picking some mushrooms on the way (not shown). 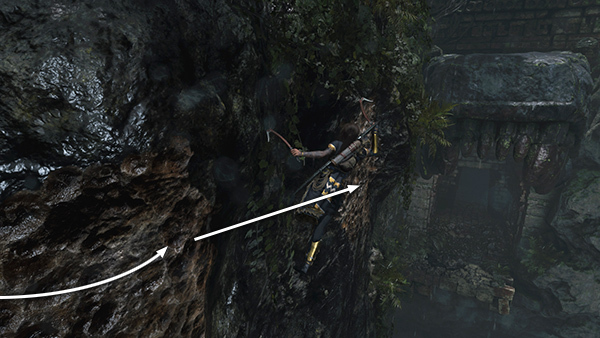 Then jump across to the climbable wall above the cave opening. 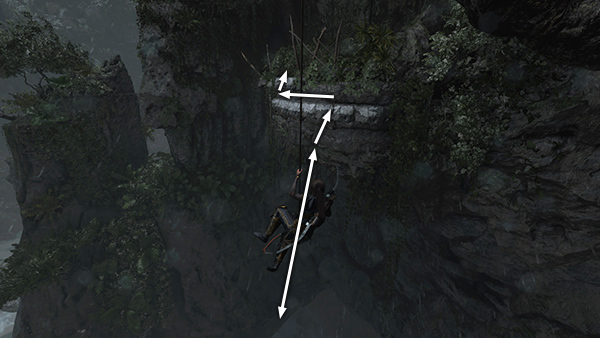 Climb/rappel down to the ground. 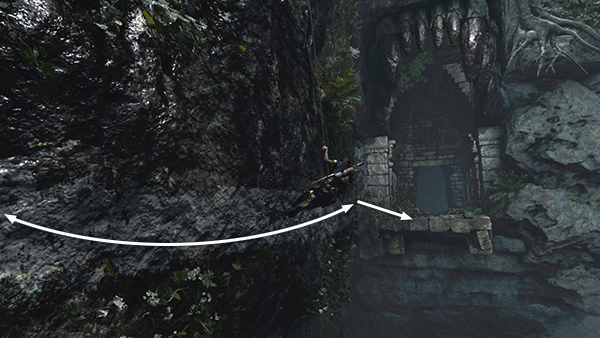 As you follow the path along the cliff's edge, you'll notice the EYE OF THE SERPENT, where you entered the CENOTE earlier, off to the left. There's also a bush with endurance herbs. 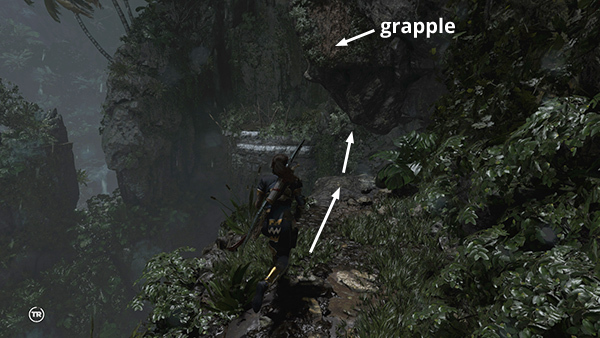 Continue to the end of the path, jump out, and grapple the craggy overhanging rock. 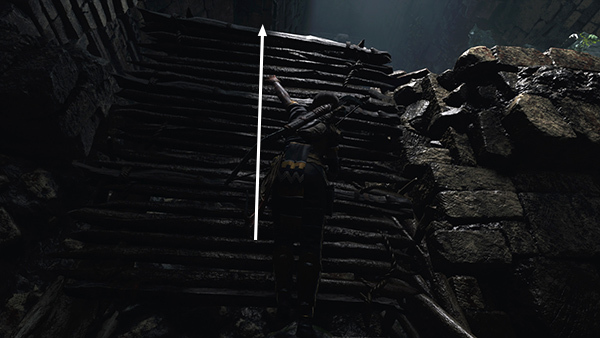 Adjust the length of the cable so Lara is roughly level with the stacked stone ledge ahead. 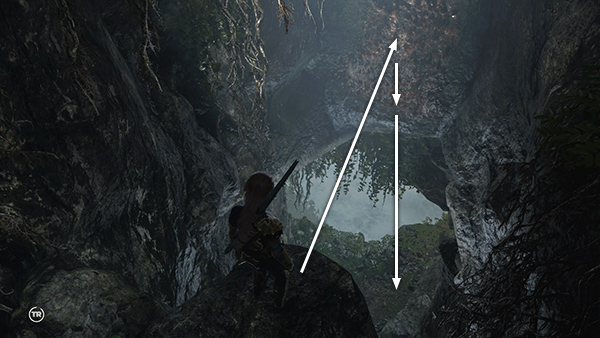 Swing back and forth a few times to build momentum, then jump to grab the right side of the ledge. 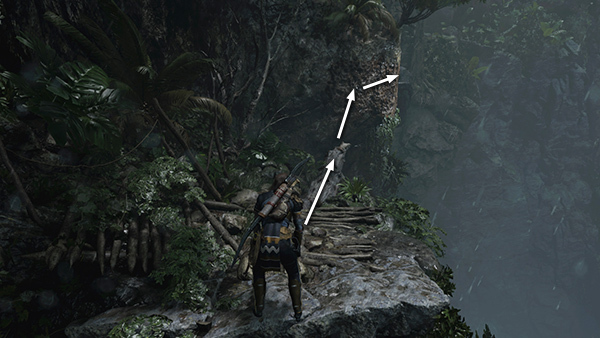 Climb to the left and upward onto the flat ledge above. 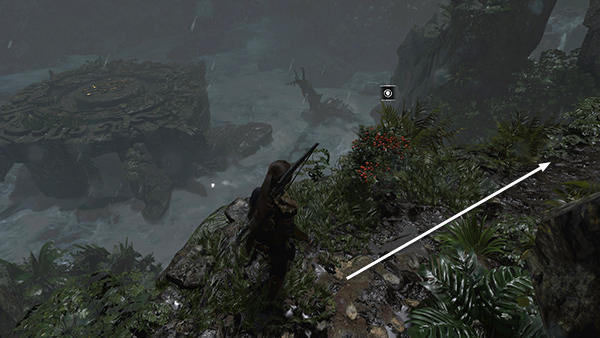 Pick some health herbs if you can carry them. 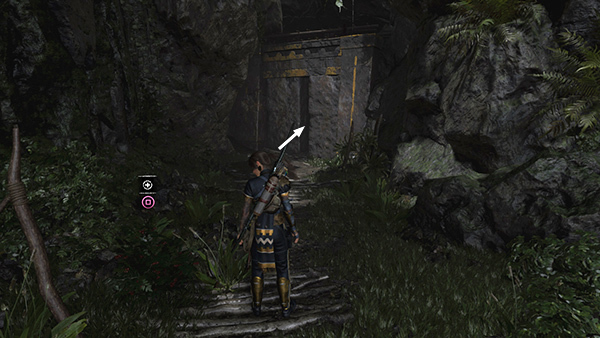 Then squeeze through the narrow opening in the stone wall to enter the temple building.